In some countries, business owners can go their way in the happy knowledge that government officials won't be hitting them up for bribes or tossing them in jail on trumped-up charges. But in other parts of the world, public sector corruption is a fact of life. Hoping to shine a light on this widespread problem, Transparency International, a watchdog NGO, has published its Corruption Perceptions Index for 2013. 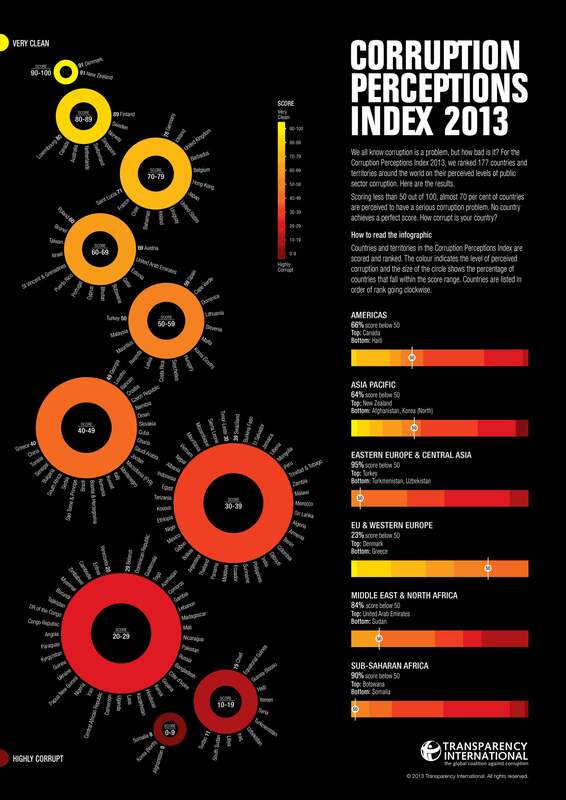 The index ranks countries around the world by perceived level of government corruption, with a score of 100 signaling an absence of official corruption and a score of 0 indicating a country that is hopelessly corrupt. Of the 177 countries and territories listed on the index, less than one-third managed to break 50. As No. 127 Nicaragua would say, that's no bueno. So in what countries can you trust public officials and what places should you avoid? What of the United States? The world's largest economy sits at No. 19 with a score of 73, while its fellow Anglophones to the north and south, Canada and Australia, are tied for 9th place with scores of 81. (Both have dropped since last year. In 2012, Canada scored an 84 and Australia an 85.) The United Kingdom is ranked No. 14. At the positively wretched end of the scale it's no surprise to see Yemen, Sudan, Syria and other Middle Eastern and African countries. But some of their scores look almost handsome beside the worst of the lot: Tied for last place are Afghanistan, North Korea and Somalia, all having scored a measly 8 on the index. How have you managed the difficulties of doing business internationally? Share some advice or an unforgettable anecdote in the comments below.